The Blalock Taussig shunt is a temporary surgical operation which is performed on newborn babies. 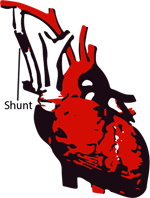 The Blalock Taussig shunt is done for the reason that the heart is not delivered enough blood enriched with oxygen to the rest of the body. This happens because the defect of heart such as Tetralogy of Fallot, tricuspid atresia, pulmonary atresia and other cyanotic congenital heart defects. Symptoms that indicate the existence of these diseases are bluish skin, nails and lips. In the Blalock Taussig shunt one of the branches of two major arteries is separated and attached with a tube directly to the pulmonary artery. This tube allows the baby to have a smooth flow of blood to the lungs. The Blalock Taussig shunt in preparation for the Fontan procedure which comes later but it is very important to the baby after birth has enough oxygen in the blood. This procedure since its foundation is several times modernized but still carries the name of the creators, a surgeon Alfred Blalock and cardiologist Helen Taussig. The Blalock Taussig shunt the very important because the first time in the history of the medical world has been proven that the heart defect can be repaired. After the Blalock Taussig shunt patients are prescribed with medications for preventing a clot in the interior of the shunt and the amount depends on the weight of the baby. After the Blalock Taussig shunt patient should not dehydrate and if occur frequent passing of loose or watery stools, puking, excessive sweating then you need to contact a doctor. There is a possibility that the Blalock Taussig shunt gets clogged and prevents blood flow, in this case, the patient is going to have a breathing problem and will become cyanotic, in that case immediately contact your cardiologist. After the Blalock Taussig shunt procedure a regular visits to your cardiologist is required. The cardiologist will perform echocardiogram of a baby’s heart to determine the condition of the heart and the shunt. Because the Blalock Taussig shunt is not a permanent surgery and because the baby’s heart grows and shunt remains the same, you can expect that your baby will need constant solution and a new operation. In addition to the above mentioned a thrombosis (formation of a blood clot) is possible and occurrence of the seroma formation, after a Blalock Taussig shunt procedure, but very rarely. The presence of a seroma after a Blalock Taussig shunt can be easily seen with the help of a chest radiograph or with the help of echocardiography. Glenn shunt is a temporary treatment that is applied on children (preceding the Fontan procedure) to improve blood flow to the lungs. The Fontan procedure is an open heart surgical procedure used in children with a defect in the structure of the heart and great vessels which are present at birth. Eisenmenger syndrome has been described as a ventricular septum defect with right ventricular hypertrophy, riding aorta and cyanosis.